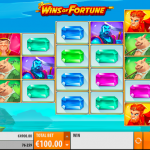 Wins of Fortune is a video slot game from Quickspin that can bring some winds of fortune your way. The game has a strange but unique set of reels that makes this slot more intriguing. The reels are set in front of a beautiful and relaxing landscape somewhere in the Far East Asia where you can practice some martial arts in order to land some wins. There are no bonus symbols in Wins of Fortune. There is only a wild which function is to substitute for all the other symbols to complete a winning line. What makes this game so good is the game play itself. So, basically every time you land a win the reel set will move one place to the left. This means that a new five row reel will appear from the right hand side and by doing that it will increase the number of pay lines. This means that it is possible to land some good wins this way. With every successive win the reels will move left. 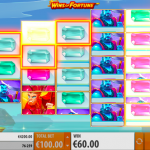 So, if you have 4 successive wins all reels will be made of 5 rows and you will receive a Super Respin. During this spin all winning symbols are frozen in place. Wins of Fortune turns out to be one heck of a game, and we need to thank Quickspin for allowing us the opportunity to play it whenever we can. The game has everything we are looking for. The game play is smooth and there are plenty of features to keep us busy. 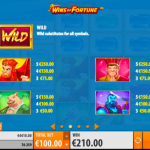 The betting options are wide so every kind of a player can find the right bet size for them. So no matter what kind of a roller you are, you will be happy with what this game has to offer. For another great suggestion but with a Japanese theme consider playing Sakura Fortune a 5 reels slot by Quickspin.